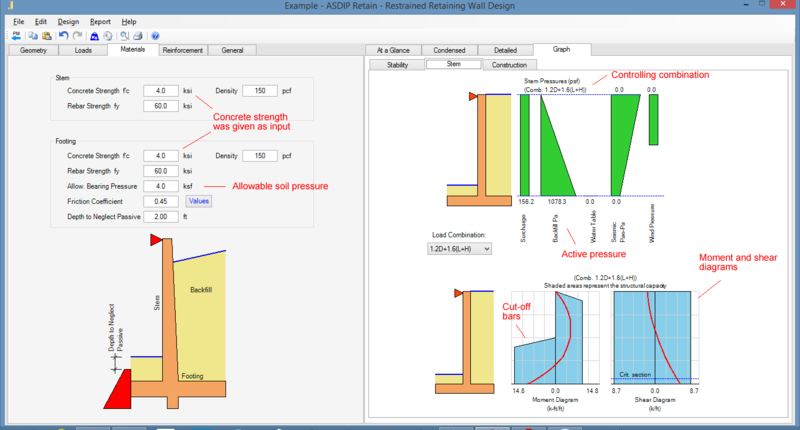 ASDIP RETAIN is a structural engineering software for design of retaining walls. 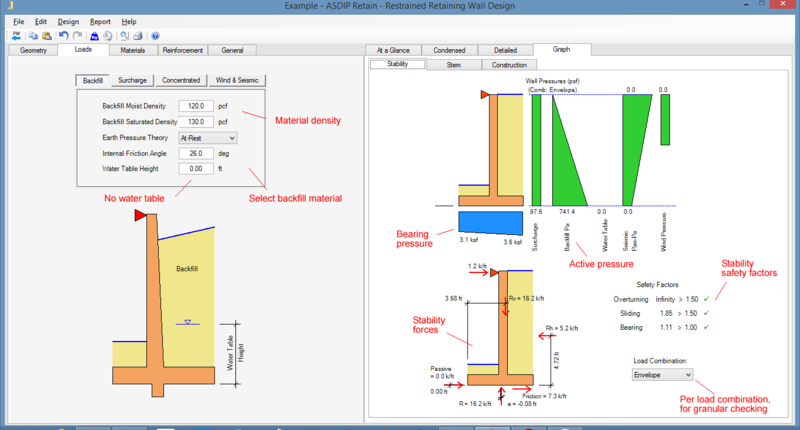 ASDIP RETAIN includes the design of top-restrained retaining walls, also called basement walls, based on the latest ACI 318 provisions. The design of retaining walls may become time-consuming, since the calculations involve multiple load types and combinations, fixity conditions, and the application of the Code provisions to design the reinforcement. 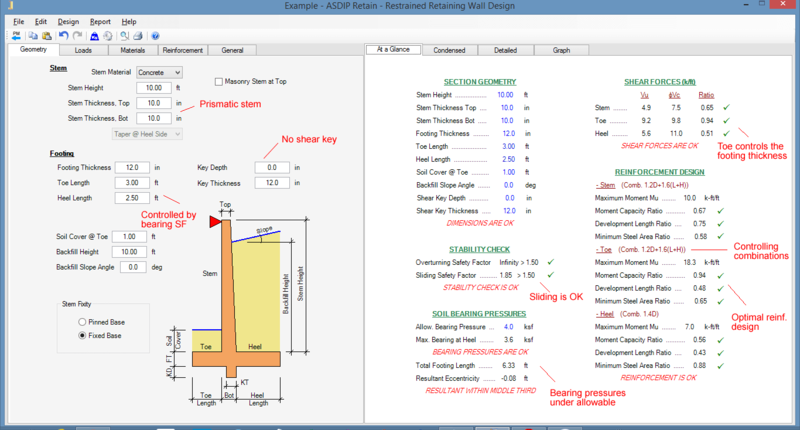 This document is a step-by-step design example of a typical concrete basement wall using ASDIP RETAIN. As an example, let’s consider a basement wall in a building, which is a restrained retaining wall with a level backfill, subject to the traffic surcharge load shown. Apply a vertical concentrated load on top of the stem as a reaction of the upper levels of the structure. The water table occurs below the wall footing. Design the optimum dimensions and find the required reinforcement. The first step is to enter the required stem height. From the given information, the stem height is 10′-0″. The toe and heel lengths will depend of the stability and strength results, so this is an iterative process. The image below shows the Geometry tab to the left, and a summary view with the most relevant result information. The next step is to enter the loads on the wall as defined above. 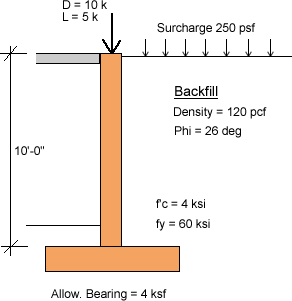 In this example the wall has a full height backfill, and a uniform surcharge on top. The image below shows the Loads tab, and a graphical view of the stability analysis with valuable information. The next step is to enter the material properties as defined above. In this example the concrete strength is 4000 psi. This will affect the shear strength, and will control the thickness of the stem and footing. The image below shows the Material tab, and a graphical view the Stem pressures and diagrams. ASDIP RETAIN includes the design of basement retaining walls. The design can be completed and optimized within minutes, which otherwise would be very cumbersome and time-consuming. 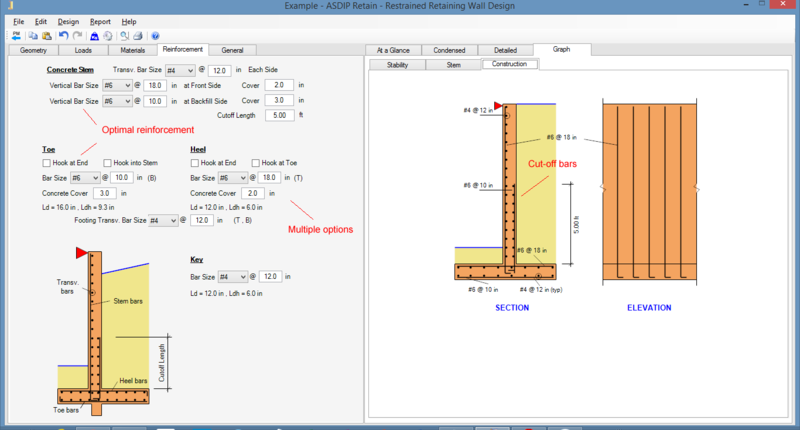 Coming soon: ASDIP RETAIN 4, with great new features such as Retaining walls on piles, Two-story restrained walls, and Counterfort retaining walls. Release date: first week of March. Prices are expected to go up. Users who purchase ASDIP RETAIN 3 now will receive the new version 4 for free. Dear Javier, the modelling of basement walls as cantilever retainning wall with pin support at top is simple common practice . In past , I have seen some basement walls with vertical cracks near the corners and column sides. At least minimum rebar should be provided in both directions at soil side and vertical bar should be extended to top and bended up to provide some fixity to ground floor slab. I agree. Please note that the software shows only the rebars required by flexure for clarity. The user would add temperature reinforcement as needed, and the anchorage details may be different from project to project. The new version 4 will show the temperature reinforcement to avoid confusion about this. Dear Javier, my comment was not for the temperature reinforcement. The modelling of the basement wall as one way bending element , fixed at bottom, pin at the top although conservative, does not reflect the real situation. The Wall has some fixity at top at coonection with ground floor slab and at corners and columns. That is, (at soil side ) additional vertical rebars at top and horizontal rebars at corners and columns will be necessary to avoid cracks. Thanks for your reply..